As a wedding photographer, providing an easy, professional and positive client experience is a priority. 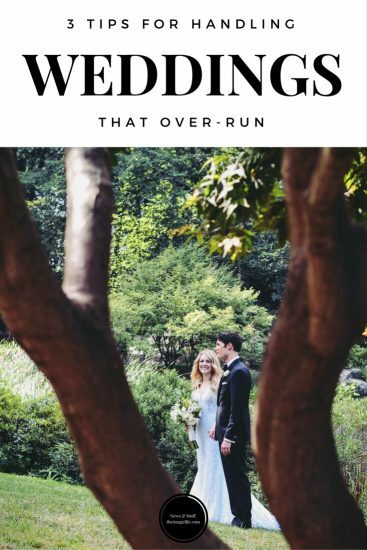 But what happens when a wedding is falling behind? And how do you bring up the awkward topic of money? At the initial client meeting, make sure you set appropriate expectations with the bride and groom. Be upfront about the type of pricing you offer, for example, some wedding photographers offer fixed fee packages that cover a certain number of hours, while others also offer an optional a la carte fee for extra hours. Whatever pricing you provide make sure you bring it up because it’s nothing to feel embarrassed about! We mentioned in previous blog posts about sending questionnaires out to clients throughout your process. This is a great way of finding out about the couple’s wedding timeline. By seeing the expected timeline for the big day you have the opportunity to calculate travel times and analyse any potential areas that could be a classed as a ‘tight squeeze’. If you think an area of the timeline needs adjusting, then be open with the bride and groom. Remember that out of the three of you, you are the most experienced when it comes to weddings. If your clients respect your work (which hopefully they do), they will appreciate the help and be open to another opinion. If you feel uncomfortable telling a couple that you think a certain area of the timeline is going to be too tight, then you could always approach the subject along the lines of – ” if you need more time on the day, adding an a la carte hour is always an option”. On the actual wedding day, be proactive. If you see that a certain event is running behind and you won’t be able to cover everything you discussed with the client within the expected time, then speak to the bride and groom (or whoever is allocated to deal with things on the day e.g. best man, mother of the bride). This doesn’t have to be an awkward conversation. You can always approach the subject by saying – “would you like me to stay another hour to capture _______ like we discussed? Or would you prefer we end the coverage at _______ as we planned?” As you have already spoken about money and timings beforehand, it’s already a given that extra hours will cost an additional fee.